Dr. Mahira Tanovic, a distinguished Bosnian American plastic surgeon who operated on civilians in her hometown of Mostar during the war in BiH. After coming to the U.S. as a refugee, she become one of the top plastic surgeons in New York and continues to help her native homeland by providing free medical care (complex surgical procedures) to underprivileged citizens of BiH. She is also involved in helping various organizations through her philanthropic efforts. All of these women have showcased immense courage, dedication, and leadership and they most certainly deserve our thanks. Furthermore, we are delighted and very honored to have with us distinguished guests from Bosnia and Herzegovina: President Zeljko Komsic, member of the BiH tripartite Presidency and the Mayor of Sarajevo, Abdulah Skaka who will join us in celebrating this special occasion. 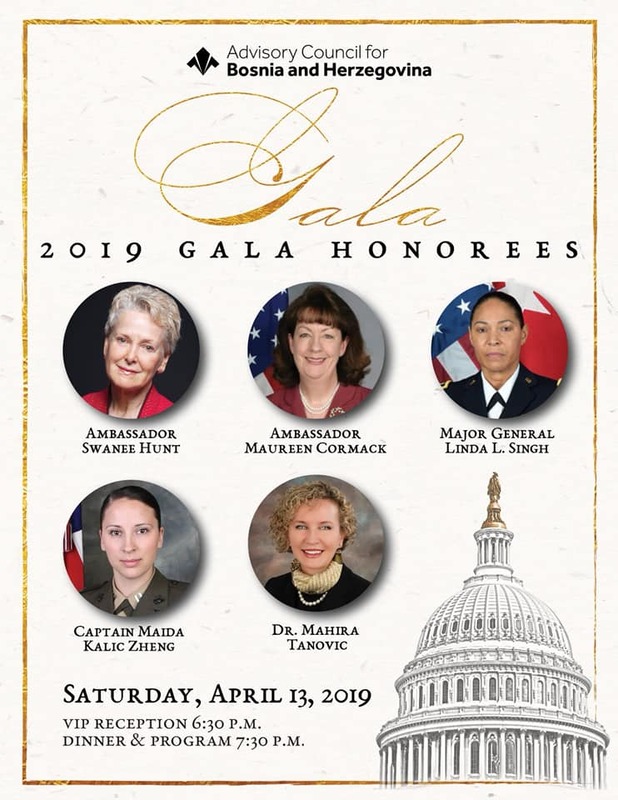 We hope that you will join us in welcoming our special guests and thanking this year's honorees on April 13, 2019 in Washington, D.C.! To learn more and to purchase your tax-deductible tickets today, please visit acbih.org/gala.